This is one of the easy and tasty recipe with egg and tamarind juice ....!!! 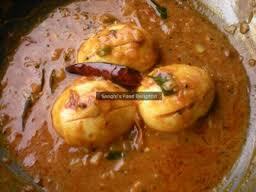 4)Make long slits into eggs , stuff the masala we have prepared . 2)Now add ginger garlic , turmeric, half of the coriander powder . 3)Add tamarind juice , salt red chili powder and bring it to boil . 4)Drop eggs in it and boil for 5 mins on slow flame. Serve it hot with rice, roti, naan ...!! !